The conversation I had with my roommate after hearing the news was mostly about how I just assume they'll try to cast a white person as Shadow, which will be what it takes to make me not watch it. Feeling like they're going to mess it up will not be enough -- if it makes it to air, I'll watch it to see *how* they mess it up. But if they cast some white dude, or some dude who really just looks white, as opposed to looking like he's brown of some sort but people are not sure which sort (unless they're black, in which case they know he's black), I will hulk out, and I will not watch. Trust. Anyway, Racialicious is talking about it today. Topics covered: Gaiman usually not being a jackass. Gaiman sometimes being a jackass. 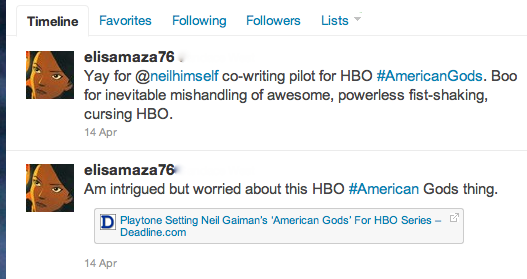 Hoping Gaiman will not be a jackass, and will have enough clout to keep the production free of jackassery. Gaiman's wife's. out of curiosity, do you watch The Chicago Code on Fox? Jennifer Beals is one of the leads and one of the episodes featured her family quite prominently. I was honestly shocked that they were all black - I had no idea she was - and I spent the whole episode thinking "Since when is Jennifer Beals black?" It was that distracting. I've never seen it - is it good? I don't think I imagined Shadow to be dark-skinned, despite his name. Hi, Anonymous. I can't be sure exactly what you mean by dark-skinned. Working from my definition, which would mean someone who looks like me, we're certainly not supposed to read Shadow as dark-skinned. He is described as ambiguous, and being dark-skinned would sort of clear things up :) But, he is also described in ways that flag him as being a person of color. My understanding, from what characters keep asking him, and from his family history, was that he was brown enough to make people keep asking "what are you? ", and light enough to make them not sure what he is. The article linked above includes a quote from Gaiman about Shadow's mixed-race-ness, in which he also cites Vin Diesel as a celebrity with a similar look. So, no, not dark-skinned, but certainly and visibly person of color -- the visible ambiguity is actually part of the character -- which is why I say that I'll be upset if he's played by someone who just looks white. I don't mean, though, that he should be unambiguous in the other direction.